WWE have confirmed that they won't be any Women's Wrestling matches when they host their Greatest Royal Rumble show in Saudi Arabia, according to wrestling reporter David Bixenspan. However, Women and children will be able to go to the event. WWE recently announced that they will be hosting a big live event in Saudi Arabia, at the King Abdullah Sports City Stadium in Jeddah on Friday, April 27th, as part of a ten-year strategy to branch out in the region in line with the country's new social and economic reform goals for 2030. Sad news for the Women's Evolution in WWE. It is being billed as the 'WWE Greatest Royal Rumble' show, as it is set to have the biggest-ever Royal Rumble match ever take place, a 50-man bout. WWE have revealed a total of seven championship matches are also to occur there. Obviously, due to the country's culture, and because of previous WWE events there preventing women from wrestling, there was a lot of interest among the WWE Universe as to whether or not Saudi Arabia would allow the WWE Women's Division to have any matches at the Greatest Royal Rumble. 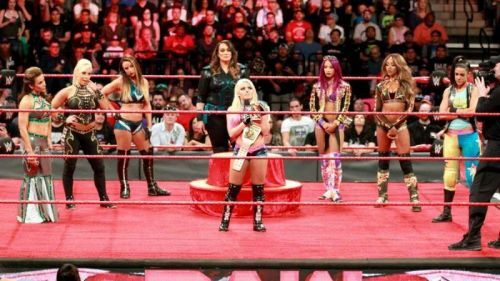 When WWE first announced that Vince McMahon and the powers that be in Saudi Arabia had organized another WWE event in the country, there was obvious attention to the fact that WWE did not advertise any of there female roster for the show. WWE never addressed its Women's Division in its original announcement about the event. David Bixenspan's tweet with WWE's Statement now totally clarifies to us that they definitely won't be competing at the Greatest Royal Rumble. The only good news from this is that Women and Children in the country can attend the Stadium, which is usually prohibited there. However, it is a real dagger in the heart for the Women's Evolution in WWE that female Superstars won't get to wrestle in the event. The Greatest Royal Rumble will happen in a month's time in Saudi Arabia's King Abdullah Sports City Stadium. The likes of John Cena, Randy Orton, Triple H and AJ Styles will be at the live event, and tickets go on sale on the 29th of March. The 50-man Royal Rumble, as well as the WWE World Heavyweight Championship and Universal Title matches, will be just some of the action that will be seen. It is, of course, unfortunate that WWE's Female Superstars won't be permitted to wrestle at this show. Hopefully in the future, like when Alexa Bliss and Sasha Banks got to make history in Abu Dhabi by being the first ever Women to wrestle there, Women's Wrestling will get to break barriers in Saudi Arabia too. The event itself is sure to be fascinating, with WWE pushing the boat out in its attempt to globalize their product. WWE Rumors: Monumental change to happen at next Saudi Arabia PPV?